So you know, I do wear a few hats (no jokes I hear you say). 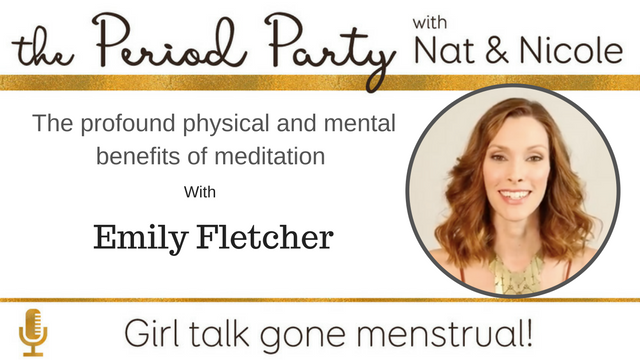 One of my favourite is being the co-host of The Period Party – a podcast we started over three years ago about all things girl talk. My co-host, Nicole Jardim and I love sharing information about all things ‘lady talk,’ and feature experts that we believe will help make your day. We’ve ramped up the volume and the awesome factor as of late and I think it’s high time I shared the episodes with you here, just so you don’t miss out! This week, we talked with Emily Fletcher. You may have heard me mention her in yesterday’s post, possibly because I’m ever so slightly obsessed with her and her 8 day online meditation course. (I’m currently enrolled) Anyway, here’s the link to the podcast and iTunes. You’re going to want to listen to this – this woman is unwrapping the cobwebs on meditation – her words, it’s been wrapped up in pachouli soaked kaftans for way to long! Let’s unwrap this shall we? Love it.